The tire changer motorcycle/ATV adapter kit is used to increase the outside clamping range of the rim clamp jaws. The adapters are installed over the existing rim clamp jaws and then secured with a screw bolt to prevent movement during use. The adapters not only increase or decrease the clamping range but also the elevation above the turntable. Purchase a tire changer and receive a FREE plastic mount / demount head! Purchase a tire changer and receive FREE a plastic mount / demount head! Every feature a high volume shop needs. Dual pneumatic assist arms make it very easy to change even the most difficult tires. Can handle wide profile, low profile tires, and run flats. Includes our bead blast technology. The bead blast shoots a powerful blast of air into the sidewall of the tire. This assists in setting beads on tire walls and inflation of the tire. Everything you need to change almost any tire that comes in your shop. 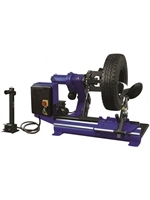 This CEMB SM915 ATI tire changer is designed especially to handle tough to change tires, like low profiles and run flats in a high performance service shop. This tire changer is best suited for large garages, wheel specialty shops, car dealerships and tire dealers. With the Low Profile Press Arm (optional) this tire changer lets you easily change stiff side walls tires. This high quality tire changer has the ability to serve both light trucks and all standard SUV's as well as specialty vehicles such as motorcycles (with optional adapter). Swing arm tire changer for motorcycles and ATV's, dual clamping cylinders, inserts protect aluminum wheels and the bead breaker is designed for motorcycle and ATV's wheels. Free shipping to anywhere in the lower 48 states!! Swing arm tire changer with added Press Arm for motorcycles and ATV's, dual clamping cylinders, inserts protect aluminum wheels, press arm and the bead breaker is designed for motorcycle and ATV's wheels. Professional tilt-back tire changer, dual clamping cylinders, clamping range 10"-28" adjustable table clamp with inflators on each clamp, fully adjustable bead breaker with smart blade system. If you’ve ever tried to manually remove or install a tire, you know just how useful a tire changing machine is! Auto body repair shops and tires shops that are frequently installing and removing tires simply couldn't live without a quality tire changer. You save time and effort when you equip your auto garage or tire facility with one of our top-quality tire changer machines and help avoid damaging valuable tires and rims. Here at North American Auto Equipment, we are proud of our selection of class-leading auto equipment, including our wide selection of tire changer machines. We add value to what we do by getting to know our products. That way, we can guide you in your selection and answer any questions you might have. For decades, we’ve been a leading online source for automotive equipment and only work with the top brands in the business. That’s your assurance that you’re choosing a reliable, high-performance tire machine that will get the job done. Stop wasting time struggling with outdated tire machines that don’t work properly or force you to manually assist to get tires installed or removed. Instead, choose one of our partially or fully automated tire changers and save effort while increasing your turnaround time. With so many tire changer machine models available, it’s simply a matter of comparing the different specifications and choosing the one that suits the way you change tires. If you’re a tire shop or high-volume auto body repair shop and changing tires all day, every day, it might be worth investing in an automatic machine to save time and effort. This type of machine will quickly pay for itself. If you’re a smaller shop or only change a few sets of tires per week, a semi-automatic tire change machine might be what you’re looking for. You can save money and still improve the speed and ease with which you change your tires. If you know which type of tire changer you want to order today, simply browse our product pages and select the model you need. If you’re still not sure which tire changing service equipment will work, we can help. Fill in our online contact form or give us a call and tell us about the nature of your tire changing operation. Do you change tires from time to time, or is it the heart of your business? Do you only change passenger car tires, or do you also change truck, tractor, motorcycle and ATV tires? Does your budget allow for a full-automatic machine or are you trying to save some money and would prefer a semi-automatic version for even more value? With this information, our expert team can help guide you to the perfect tire changing machine. We have decades of experience in the business and know that our customers want quality machines they can count on. If you are interested, we can also tell you about our competitive financing rates, so let us know if you'd like to learn more. With North American Auto Equipment, you get a great selection of the best tire-changing machines on the market and our unbeatable customer service. It's easy to see how we've become a leader, so come and benefit from our reputation as the top choice for auto equipment and tire-changing equipment today!